Pending home sales took a deep dive in January, falling to their lowest level in over three years. The National Association of Realtors® (NAR) said its Pending Home Sales Index (PHSI), a forward-looking indicator of existing home sales, fell 4.7 percent to 104.6. The December index, which had represented an 0.5 percent increase from November, was revised down from 110.1 to 109.8. The January loss put pending sales 3.8 percent behind the pace in January 2017 and at its lowest level since October 2014. Analysts had expected the index, which is based on contracts to purchase an existing home, to increase slightly from the previous month. The range of estimates from those polled by Econoday ranged from -0.2 percent to 0.8 percent. The consensus was 0.3 percent. Lawrence Yun, NAR chief economist, noted that January's performance ended a three-month streak of modest increases. "The economy is in great shape, most local job markets are very strong and incomes are slowly rising, but there's little doubt last month's retreat in contract signings occurred because of woefully low supply levels and the sudden increase in mortgage rates," he said. "The lower end of the market continues to feel the brunt of these supply and affordability impediments. With the cost of buying a home getting more expensive and not enough inventory, some prospective buyers are either waiting until listings increase come spring or now having to delay their search entirely to save up for a larger down payment." Added Yun, "Even though contract signings were down, Realtors® indicated that buyer traffic in most areas was up in January compared to a year ago. The exception was likely in the Northeast, where the frigid cold snap the first two weeks of the month may have contributed some to the region's large decline." The inventory was at an all-time low for a January and down 9.5 percent from last year. Yun said that new home construction is moving closer to its historical annual average of 1.5 million starts but that two other factors must occur to alleviate the "excruciatingly low" supply levels. Institutional investors must start to unload the portfolio of single-family properties they acquired during the Great Recession, and more existing homeowners must decide to sell. "As new multi-family supply catches up with demand and slows rents, some large investors may begin putting their holdings of affordable single-family homes up for sale, which would be great news, particularly for first-time buyers," said Yun. 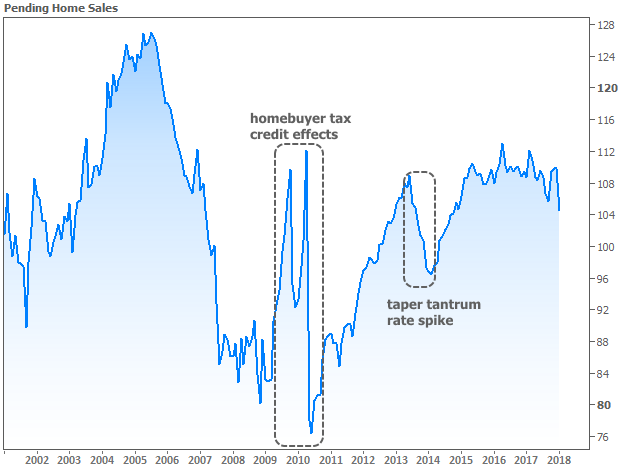 "Furthermore, sellers last year typically stayed in their home for 10 years before selling (an all-time high); although higher mortgage rates will likely discourage some homeowners from wanting a new home with a higher rate, there are possibly many pent-up sellers who may look to finally trade-up or move down this year." Yun forecasts that existing home sales in 2018 will be roughly the same - around 5.50 million units - as in 2017 when sales totaled 5.51 million units. The national median existing-home price this year is expected to increase around 2.7 percent. In 2017, existing sales increased 1.1 percent and prices rose 5.8 percent. The downturn in pending sales affected all four regions of the country and dropped all of them behind their year-earlier levels. The PHSI in the Northeast plunged 9.0 percent to 87.0, putting it 12.1 percent below the January 2017 level. The index in the Midwest fell 6.6 percent to 98.2, down 4.1 percent year-over-year. Pending home sales in the South declined 3.9 percent to an index of 121.9, a 1.1 percent annual loss. The index in the West decreased 1.2 percent in January to 97.9 and is 2.5 percent below a year ago. The Pending Home Sales Index is a leading indicator for the housing sector. A sale is listed as pending when the contract has been signed but the transaction has not closed, though the sale usually is finalized within one or two months of signing. The index is based on a large national sample, typically representing about 20 percent of transactions for existing-home sales. An index of 100 is equal to the average level of contract activity during 2001, which was the first year to be examined.